Installation et Configuration de Snoge – System-Linux. Snoge est un logiciel opensource qui permet de représenter dans un Google Earth en “quasi temps réel” d’où proviennent les IP attaquantes relevées par Snort : SnoGe = Snort + Google Earth. Comme on peut le voir sur l’image, un histogramme bleu représente le nombre d’attaque provenant d’un même FAI. Un histogramme Vert représente le nombre d’alerte par pays. Les lignes montrent les dernières attaques détectées. Plus le lien est foncé, plus l’attaque est récente. Met à jour un fichier kml (Fichier Google Earth, proche du xml). 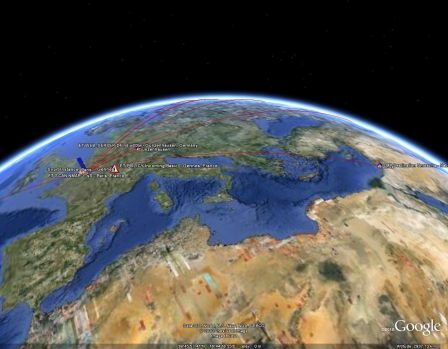 Votre Google Earth interroge périodiquement votre serveur Web, afin de récupérer ce fichier kml, et affiche les attaques sur carte mondiale. High Scalability – High Scalability – Google’s Colossus Makes Search Real-time by Dumping MapReduce. As the Kings of scaling, when Google changes its search infrastructure over to do something completely different, it’s news. In Google search index splits with MapReduce, an exclusive interview by Cade Metz with Eisar Lipkovitz, a senior director of engineering at Google, we learn a bit more of the secret scaling sauce behind Google Instant, Google’s new faster, real-time search system. Ethercodes Is a Web-based, Collaborative Programming Notepad. Think of EtherCodes as EtherPad for developers. Featuring line numbers and syntax highlighting, it lets you code with a group, in a web browser, in realtime, without sacrificing some of the comforts of your favorite text editor.